An Iran with nuclear weapons is a rather unsettling prospect considering what they have been doing to encourage unrest in the Middle East, their attitude towards Israel and the west and their beliefs as have been shared about in earlier newsletters. It would certainly make the Middle East a more dangerous place and increase the risk of such weapons getting into the hands of terrorists. "The Wisconsin Project on Nuclear Arms Control, American's scientific watchdog on world nuclear weapons production, estimates that by Dec. 2008, Iran had accumulated enough U-235 to fuel one nuclear bomb; by 2009, enough for a second, by August 2010 material for a third bomb and by April 2011, enough enriched uranium for a fourth bomb. "These estimates presuppose an Iranian decision to further process low-enriched material to weapons grade -- a process taking no more than a couple of months. "Iran, says the Wisconsin Project, is consolidating its status as a 'virtual' nuclear weapon state -- meaning it can set about building a bomb whenever its rulers so decide." uranium at one facility alone. "Senior RAND Corporation defense policy analyst Gregory S. Jones says that Iran is very close to building a nuclear bomb. "Reviewing data from an International Atomic Agency report published two weeks ago, Jones analyzes Iran's uranium enrichment program ounce by ounce and concludes, not only is a bomb likely, it's unstoppable short of military occupation." 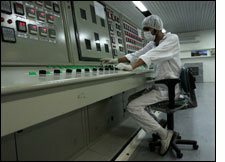 Iran's leadership is undaunted by the sanctions imposed on the country and seems unhindered by the damage the Stuxnet computer worm caused to the centrifuges at the uranium enrichment facility in Natanz. VIENNA -- The procession of cars carrying Fereidoun Abbasi Davani sped down Vienna's Wagramer Strasse this Monday and into the underground car park of the International Atomic Energy Agency. Outside the building, on the bank of the Danube River, some 30 protesters from the Stop the Bomb movement demonstrated, waving signs denouncing the Iranian nuclear scientist. But Iranian security officers seemed more concerned about the prospect of someone trying to exploit Abbasi Davani's controversial visit to finish the job. "On November 29, 2010, anonymous assailants tried to assassinate Abbasi Davani as he emerged from his home in Tehran. He and his wife, seated next to him in the car, were hit by gunfire, but survived the assassination attempt. Iran blamed the Mossad for the failed operation. "The assassins were more successful in a different attack launched that same day, which killed another nuclear scientist -- Majid Shahriari." Washington - Iran is moving to cement ties with the leaders of three key American allies -- Afghanistan, Pakistan and Iraq -- highlighting Tehran's efforts to take a greater role in the region as the U.S. military pulls out troops, The Wall Street Journal reported Monday. 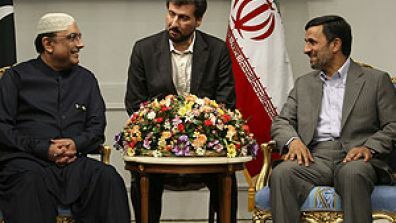 The Afghan and Pakistani presidents, visiting Tehran, discussed with Iranian President Mahmoud Ahmadinejad "many issues ... that might come up after the NATO military force goes out of Afghanistan," Iranian Foreign Minister Ali Akbar Salehi said. The overtures by U.S. nemesis Iran come amid tensions between Washington and three governments that have each received billions of dollars in U.S. aid. Afghan President Hamid Karzai, before traveling to Tehran, welcomed President Barack Obama's announcement on Wednesday that the U.S. would withdraw 33,000 U.S. troops from Afghanistan over 15 months. 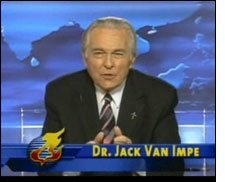 North Korea's last round of tests, conducted in May 2009, appear to have included a "super-EMP" weapon, capable of emitting enough gamma rays to disable the electric power grid across most of the lower 48 states, says Dr. Peter Vincent Pry, a former CIA nuclear weapons analyst and president of EMPact America, a citizens lobbying group. South Korean defense minister, Kim Kwan-jin, told his country's parliament on Monday that North Korea had succeeded in miniaturizing its nuclear weapons design, allowing them to place a nuclear warhead on a ballistic missile. "Like a steaming kettle with the top on, pressure is building beneath the surface of California that could unleash a monster earthquake at any time. That's according to a new study from the Scripps Institute of Oceanography. "Geologists say Southern California is long overdue for a huge earthquake that could unleash widespread damage. "They fear the pressure is building and the area could be as many as 100 years overdue for a mega-quake quake, measuring 7.5 or larger." "So many economists and financial pundits seem absolutely shocked that the U.S. economy is slowing down again. It is as if this latest wave of bad economic data has caught them completely by surprise. Now, in the mainstream media we are seeing all kinds of headlines declaring that the U.S. economy is headed for disaster. But anyone with half a brain could have seen this coming. "This year alone, we have seen the worst tsunami in Japanese history, the worst U.S. tornado season in recent memory and the worst Mississippi River flooding in decades. In addition, chaos in the Middle East has pushed the price of oil up to very high levels. Of course all of those things were going to have an effect on the economy. In addition, all of the long-term trends that have been destroying the U.S. economy for decades have not been taken a breather. In fact, the truth is that all of our long-term economic problems have been accelerating. 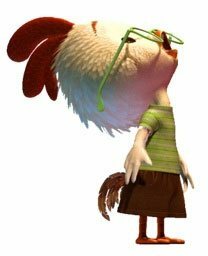 So yes, the sky is falling, it is time to panic and the U.S. economy really has fallen and it really can't get up. It is just that everyone in the mainstream media seems to have believed that Ben Bernanke and Barack Obama would just sprinkle a bunch of fairy dust on the economy and everything would just magically get better. Well, in the real world things simply do not work that way." "Even more chilling is the fact that over 300 prominent Christian leaders signed a letter issued by the Yale Center for Faith and Culture claiming that world peace is dependent on Muslims and Christians recognizing 'Allah' and 'Yahweh' as the same God."